The Free Selection tool, or Lasso, lets you create a selection by drawing it free-hand with the pointer, while holding down the left mouse button (or, for a stylus, pressing it against the tablet). When you release the mouse button, the selection is closed by connecting the current pointer location to the start location with a straight line. You can go outside the edge of the image display and come back in if you want to. The Lasso is often a good tool to use for “roughing in” a selection; it is not so good for precise definition. Experienced users find that it is often convenient to begin with the lasso tool, but then switch to QuickMask mode for detail work. 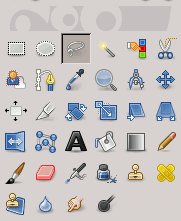 For information on selections and how they are used in GIMP see Selections. For information on features common to all selection tools see Selection Tools. The Free Selection tool is much easier to use with a tablet than with a mouse. 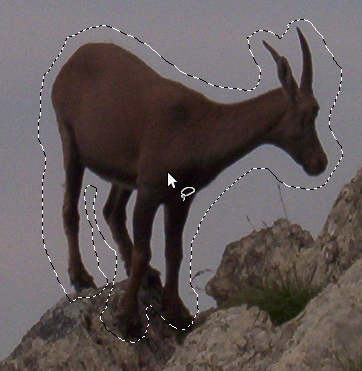 A new possibility came up with GIMP-2.6: the polygonal selection. Instead of click-and-dragging to draw a free hand selection, you can click only. This creates an anchor point. Then moving the mouse pointer draws a line with a new anchor point that you can move as long as you don't click again (the mouse pointer comes with the moving cross). Clicking again anchors this point and creates a segment. By pressing the Ctrl keyboard key while moving the mouse pointer contrains moving angles to 15°. So, you can mix free hand segments and polygonal segments. 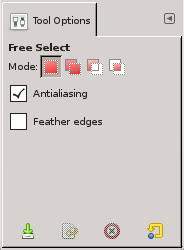 by using the keyboard shortcut F.
The Free Select tool does not have any special key modifiers, only the ones that affect all selection tools in the same way. See Selection Tools for help with these. To move the selection, see Moving selections. Figuur 14.20. Rough selection with the Free Selection tool. Normally, tool options are displayed in a window attached under the Toolbox as soon as you activate a tool. If they are not, you can access them from the image menu bar through Windows → Dockable Windows → Tool Options which opens the option window of the selected tool. The Free Select tool has no special tool options, only the ones that affect all selection tools in the same way. See Selection Tools for help with these.